It has been a little while since I have had the chance to talk about cooking and I have a wonderful reason why. Things change rapidly when you have a five month old living in the house and we are having a blast with our new foster baby. Mostly hobbies get put on hold and all your attention is now focused on something much better. There is just something especially sweet about a little one falling asleep in your arms, thinking that you are the only one that matters and that they are safe where they are. Who knew happiness could be so wonderful. Looking into the eyes of my wife holding my “boy” is the most beautiful thing in the world. Babies are also very exhausting though and many times you just want to do something simple so that you can relax for the evening. That is if you get the chance. I haven’t forgotten cooking. In fact, things have been done that I would like to blog about, but time is of the essence. In other words time is limited. It was once said that children spell love “T-I-M-E” and I want to make sure that he gets the most of it. That means that FOOD has to be much quicker and simpler. Like spaghetti instead of a four course meal. This is why I decided to talk about “French Toast.” I know that it is not really anything special, but it is something that any beginning chef to a professional can enjoy. I found a really easy recipe that does not take a lot of time and tastes exquisite. 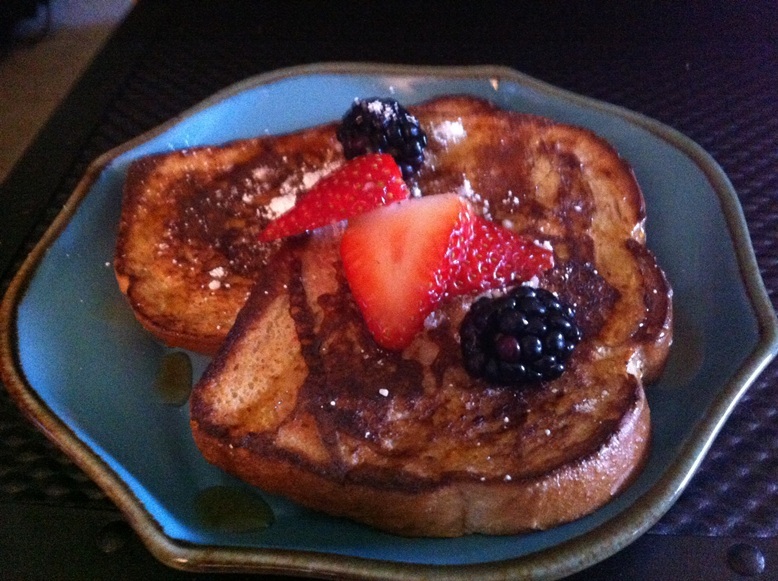 A little bit of Fruit or powdered sugar can make any French Toast have some appeal and this one is no exception. Use some Texas Toast and it will be thicker and fluffier. I would do it again and again; in fact, I have. Add a little bacon and eggs and you have a wonderful start to a new day. Check out my latest Snapguide Turkey and Bacon Salad Sandwich with step by step instructions. The after Thanksgiving and Christmas “What do I do with leftover” Turkey and Bacon Salad Sandwich. This turned out wonderful. Brussels sprouts have been the bane of every child’s existence since probably the beginning of time. They are, “Little cabbages the size of golf balls all green and slimy”. At least this is what a friend described while talking about them. I can hear the “Psycho” music playing in the background “screech, screech, screech, Ahhhhhh!” end of shower scene, or in this case Brussels Sprouts sitting in front of you on the table. However, Brussels Sprouts are not evil. For I have tasted them, and they are glorious! “Just add bacon” is probably the key phrase when talking about them. A while back I was watching a show called “5 Ingredient Fix” with Claire Robinson, and she made a dish called Crispy Brussels Sprouts, that looked pretty good. So I took the time to try it myself. My family loved it. These are not the green slimy disgusting vegetables that most people think about. These are crisp, full of flavor, and a creative food that brings a new taste to something people have demonized. Start with a slab of bacon cut into pieces and baked for about 10 minutes. 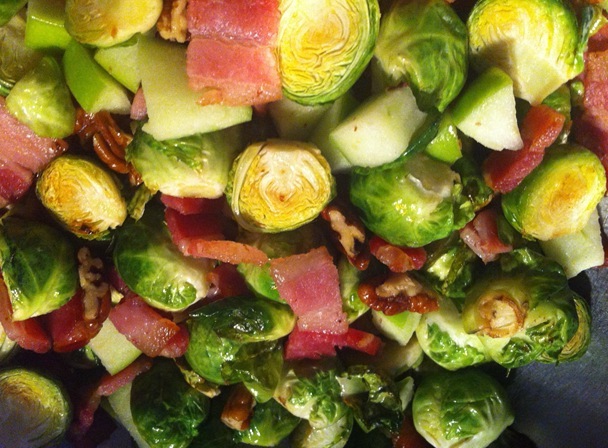 Separate the bacon, and bake the Brussels Sprouts in the grease left from the bacon. I used sautéed pecans instead of walnuts, and it added much to the recipe. Mixing everything together makes a wonderful salad or side dish. Best of all, I sautéed the left overs in butter the next day, and it tasted even better. Thanksgiving and Christmas are coming, and I cannot wait. I know they are a little ways off, and Halloween has yet to pass. Still the excitement of the holidays and all the goodies involved with each are enough to get your mouth salivating for the future. Halloween has its candy and cookies. Thanksgiving has its turkey and pumpkin pie, and Christmas could mean many things. 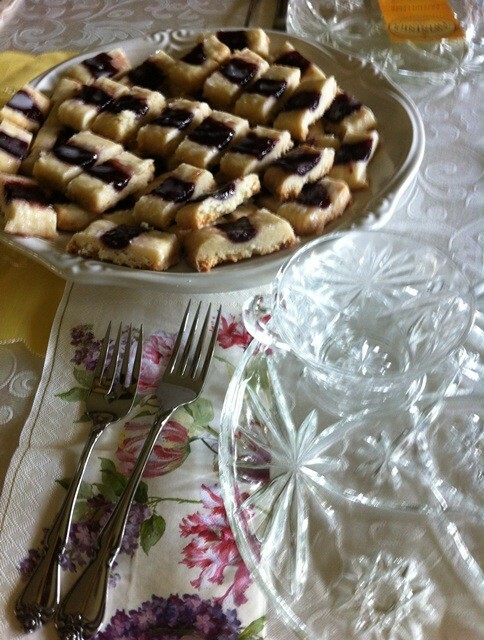 Raspberry Short Bread Cookies are a treat I always equate with the holidays. Do you remember the little holiday cans filled with small tasty cookies? These are the cookies that I think about when I reminiscence about Short Bread. Remembering and celebrating good times with family and friends is what the holidays are all about. 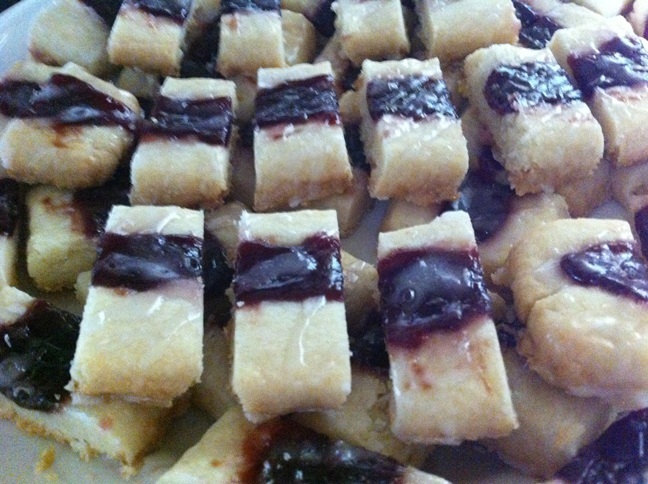 Raspberry Short Bread Cookies are really not that difficult to make. After I got past the initial shock of the unconventional cookie dough, they turned out to be wonderful little additions to my friend’s birthday tea party that I mentioned last week. After mixing the main ingredients together, I saw that the dough looked like a graham cracker pie crust, except flaky. I started to think that something had gone wrong. I expected a more adhesive dough. The recipe says to mix until light and fluffy, but flaky seems to be a better description. Upon rolling the dough, it becomes more adhesive, and the expected cookie shape begins to form. Cut them into strips as the recipe states, and you are well on your way. To create a crease for the jam to set into, I used my thumb and made a little valley. The recipe says to use a wooden spoon end, but mine was built differently. A clean dowel rod might work as well, if you have a big enough one available. Scones are just not something I thought that I would really enjoy. My only experience with them has been at the local Starbucks, and I just assumed that they were supposed to be hard and stale. Not that Starbucks Scones are like that, but I had one, and it was not a very memorable experience. So I stick with my Lemon Loaf, Banana Nut Bread, or an occasional Cheese Danish at Starbucks. 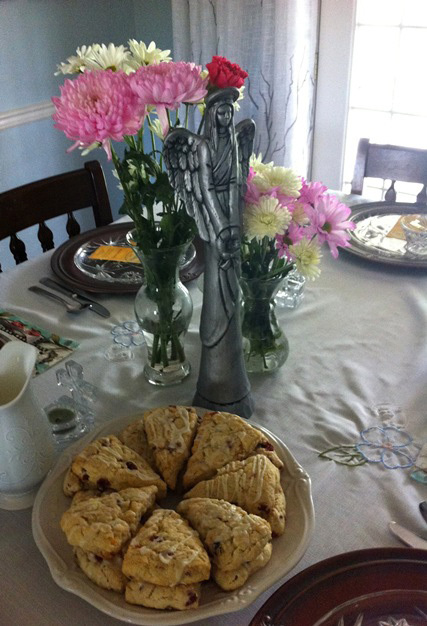 However, I have now experienced what a fresh, beautifully baked scone is supposed to taste like. Recently, a friend of mine had a milestone birthday. (I can’t very well tell her age now, can I?) Her husband, my wife, and I decided to throw her an old-fashioned Tea Party. We thought that it would be an elegant way to celebrate and have a delightful time with someone who loves tea and is elegant in her own way. In searching for some treats for the party, I discovered Orange Cranberry Scones and Raspberry Shortbread Cookies (coming next week). And yes, they are as delightful as they sound. Maybe not “Harry and Sally” famous restaurant scene good (just think excitedly good), but extremely close. These babies are easy to make, but you will need a food processor, a way to zest an orange, and an 8″ round cake pan. This gave me a chance to buy something that I have long wanted, expanding my abilities in the kitchen. After all, if you put a blade on a motor, it is as much a power tool as a skill saw or a miter saw might be! I can hear Tim Allen grunting now. I know Tim Allen and Tea Parties are a weird combination, but I still say MORE POWER! Mixing everything together is just a one, two, three process that doesn’t take very long to accomplish. Oddly, the recipe said something that I didn’t understand, “Don’t Over Mix!” What does that mean to someone who has never made this thing anyway? I guess that if you over mix the batter with the milk, the texture will not come out right, but don’t over think it. My batter was moist, but it still had some powdery areas. Once I pressed it into the Saran Wrap covered pan, the moisture blended with the remaining crumbling areas. As long as you follow the recipe, I think that you will be fine either way. Experiment a little, and enjoy a delightful treat. We made them the night before, and some the day of the party. They kept very good (in an air tight, sealed container) for a few days even after the party. Of course, they didn’t last long enough for them to even think of going bad! 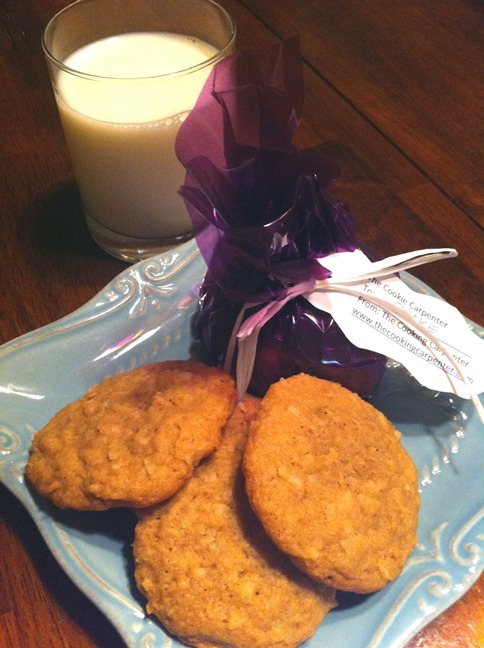 Check out the recipe below, and I will post the Shortbread Cookies next week. It has been a while since I posted something about carpentry, let alone a post at all. Life has been a little crazy lately. 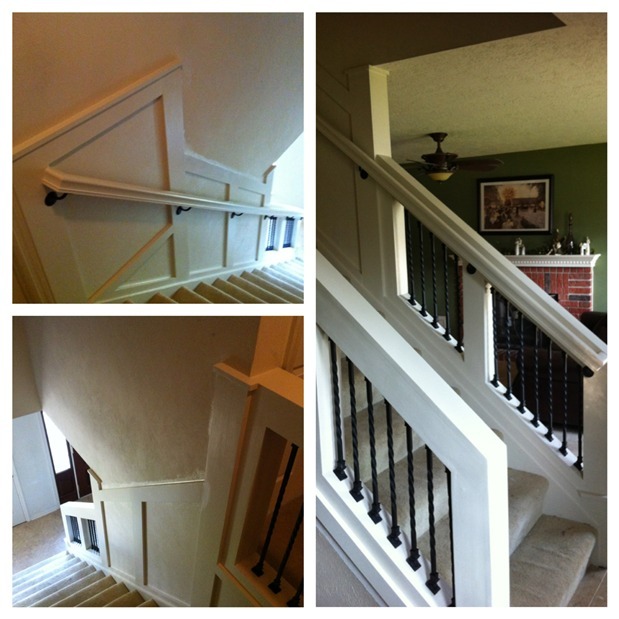 We have been working to prepare the house for children, and one of the things that I wanted to fix was the railing for the staircase. I just did not think that it was sturdy enough, and I wanted to make it safe for the children. We have finally gotten through all the interview process with DePelchin and have been licensed as Foster to Adopt parents. We are so excited and cannot wait to see what is going to happen next. Patience is a definite key to the process; both for the interview and building the banister. We started learning about DePelchin about two years ago and have been in the process of getting ready for children since then. Don’t worry if you are in the process yourself, because I do not believe it usually takes that long. After the first orientation, we found that some things were going to have to happen before we could go any further. So we took the first year to just prepare, and then we went to another orientation. This is when the real process started. Training, interviews, and continuing to prepare the house have been our main focuses since then. See where patience came into play? A major area of our concern was the staircase. I knew I wanted to make it sturdy and safe, and I had a plan to do that. I framed a 2×4 stud rail and lag screwed it into the existing frame of the house. This rail was not going to go anywhere after that. Once it was connected, I faced it with a poplar material. It is a straighter and prettier material than pine, and I figured that it would be easier to box out with. The time was in the sanding. I have to admit, if you want it to look nice, you have to take the time to sand it. Mine took about 4 full Saturdays including the paint and wainscot. A Friend of mine and co-worker (Carpenter) said that this is always the case when it comes to trim. He could do it much faster, but for better results, he said that you have to take your time. Check out the picture above, and hopefully it will inspire you to try to do something as well. Almost everyone dreams of heaven and what it will be like. The old stereotype is that of an angel sitting on a cloud with his harp in hand and just singing to everyone’s heart’s content. Some think that it will be a taco bar with cigars and drinking or a glutton’s paradise. Others might think that it’s a hot night with supermodels, but makes you wonder if it would be heaven for “the supermodels.” In all reality though, heaven will be a wonderful place filled with joy and happiness, with no sickness, death, or trials and tribulations. To me it is a place that people will want to go because of the euphoria of just being there and being in the presence of a God and others who have gone before us. So you might ask “Why all the talk of heaven?” Well I guess it comes back to the stereotype of the angel sitting on the clouds. I took some of Anita’s Chicken and Dumplings to work so that a coworker and friend of mine could try it and let me know what she thought about it. She said that it was like eating clouds. I thought that was a perfect analogy of what the dumplings were like. Done right, they have a perfect consistency for the soup. Clouds and heaven just seemed to fit with this recipe. There was a certain euphoria of a heavenly soup that tasted like you were eating clouds and at the same time was soothing to the soul. It is easy to make. My sister-in-law helped prepare it. She has down-syndrome, and I enjoy getting the time to cook with her. She is so enthusiastic about the task at hand, and we had a wonderful time cooking together. Heaven will be like this, spending time with the ones that we love [maybe not cooking chicken or it might not be heaven for the chicken]. There will be peace and love. My impression is that this is a great soup to make. A couple of things I might do different though would be to cut back the chicken and add some more of the spices. There was too much chicken, and the soup could have used just a little more flavor. Over all it was a wonderful soup. Things like some extra poultry seasoning, rosemary, thyme or something to give it a little more of a kick in flavor would go a long way. Even trying to add some spinach for the last few seconds of it cooking might be interesting as well. Add some extra carrots and celery too, because it gives it a chunkier feel. Most of all, I would definitely say don’t stray from the instructions on the dumplings, because that was the part that truly made this recipe heavenly. “Oh, I’ve got a lovely bunch of coconuts, Deedly Dee! There they are all standing in a row.” OK maybe you won’t get this one unless you have children or are one, and I guess I am probably the latter of the two. Both Zazu and Rafiki sing this song from “The Lion King,” and it gets stuck in my head almost every time that I think of coconuts. Movies are a great part of what I enjoy, including “The Lion King”, but it seems that sometimes it is the easy date choice. Every Friday for probably the last ten years, my wife and I have tried to make it a priority to have a standard date night. Sometimes they get routine by just going to a movie and having dinner. Not much conversation and interaction are involved when going to a movie, and I have been trying to think of more creative ways of enjoying time with my wife. This last Friday for our date night we decided to make cookies for some of our friends and just spend some quality time together. We made Coconut Butter Cookies (this is where the coconut comes in) and Peanut Butter Cookies. It really didn’t take long to make the dough, then we realized that we had to refrigerate them for three hours. 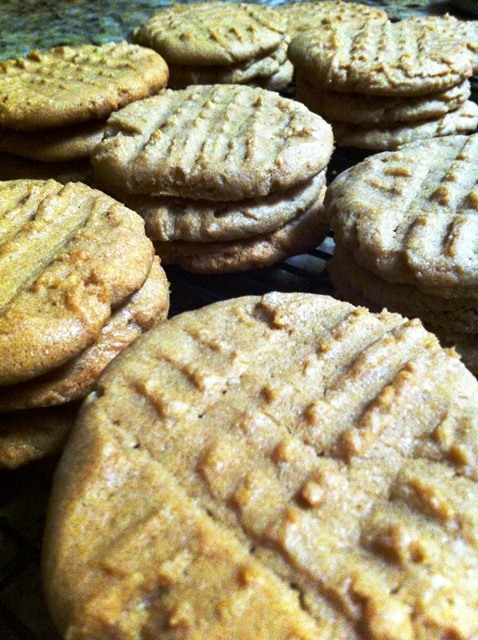 The Peanut Butter Cookies we could have made right away, but I like a chewy cookie. The recipe said, “for a chewy cookie refrigerate for 3 hours.” I decided to let them stand overnight, and we enjoyed the rest of the night together. Both cookies are excellent recipes and are very easy to make. Do not let the wordiness of the one overwhelm you. It is an excellent recipe. We mixed each ingredient individually to get an even mixture and enjoyed the cleanup afterwards. After all you get to taste the cookie dough off of the bowl and spoon. It was fun, and we enjoyed being able to hand out the cookies to our friends. Meet Flank. Flank is my new friend. Liquor him up, and he is the life of the party! Our party consisted of just a few friends and a wonderful night of good, ol’fashioned steak and potatoes. 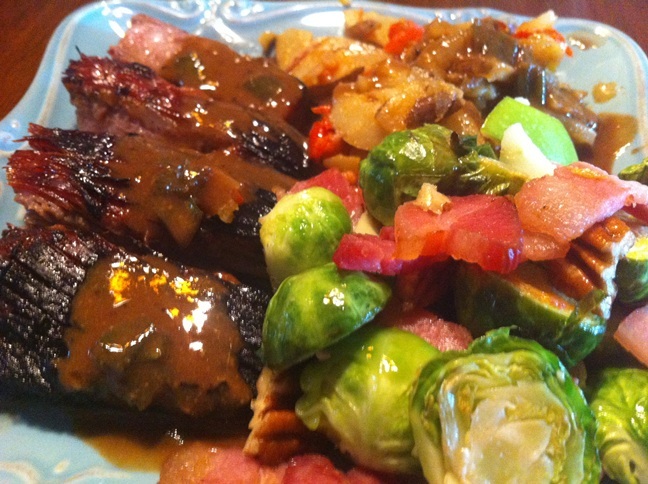 Bourbon and Brown Sugar Flank Steak is one of those steaks that you have got to try. 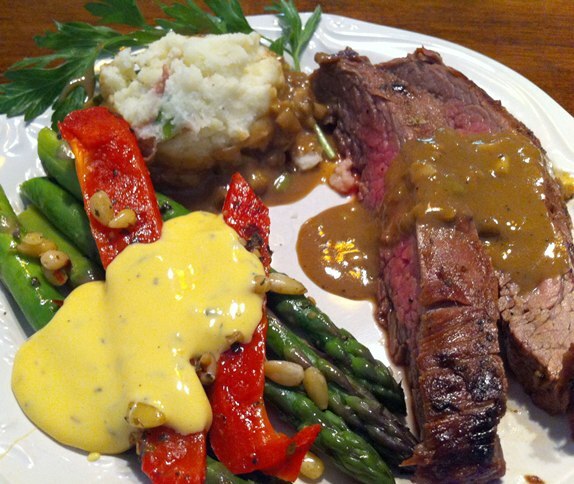 We had some friends over and they said that it was one of the best steaks that they have ever eaten. And “OH MY” the flavor is just irresistible. Have I got your mouth watering yet? Good because it should be, and I know mine is. First of all you will have to get some bourbon. I used Ezra Brooks Bourbon Whiskey. The Liquor Shop attendant recommended it to me, as it is an inexpensive, good quality bourbon whiskey. Then, I went to the meat counter and asked for a 2 pound “trimmed” flank steak. Be sure to give your dish some time. I recommend that you marinade this steak over night.The sides become easy to cook, and all you need to do is throw it on the grill. Get a Ziploc bag or a Tupperware container and combine the first seven ingredients: Brown sugar, minced green onions, bourbon, soy-sauce, Dijon mustard, and Worcestershire. DO NOT poke, prod, pinch, or do any thing else to tenderize the meat. Just stick it in the bag and refrigerate over night. Let the alcohol, sugar, and marinade all blend together and tenderize the meat on its own. One day later, remove the steak, and stick it on the grill (5 minutes on each side approximately), depending on how you like your steak cooked. Add some cornstarch to the marinade and heat it up for a nice gravy. This steak was fast, easy, flavorful, pink in the middle, and moist. Click on the links above for the recipe. OK, so Rasta Pasta just sounds cool. 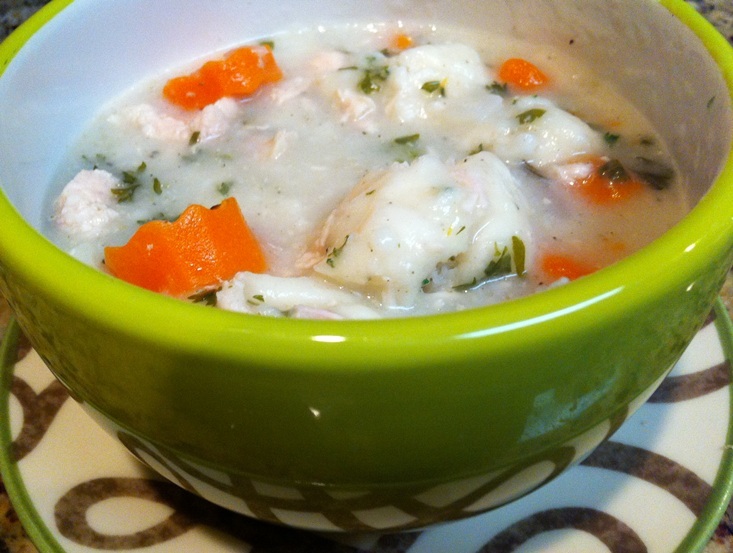 This recipe is from “Fins Up! 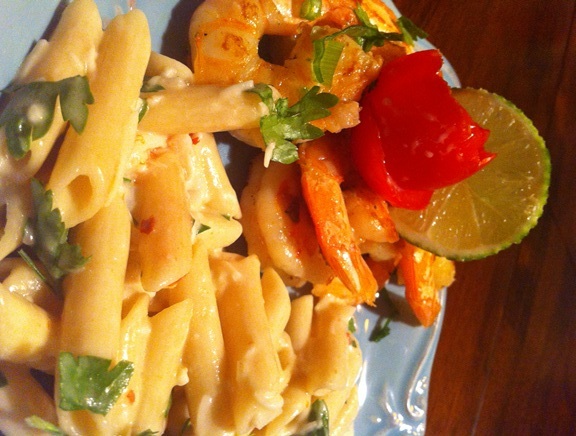 (Jimmy Buffet) Cooking Class with Leigh Ocs.” This is a wonderful addition to the Tequila-Orange Shrimp that I wrote about last week. It has an unexpected Caribbean taste. But what else should I expect, it does have Jimmy Buffet’s name attached to the top. I would have never imagined using coconut to make a creamy pasta, but it is exquisite! While the coconut flavor does come through, I might consider adding some coconut flakes to the prepared pasta or using real coconut milk to even further enhance the flavor next time. I heated the coconut to a boiling point and let it simmer for a little while. Then strained it into a bowl and pushed as much flavor out of the coconut that I could get with a fork. Actually it did not seem like it was working, so I picked it up and squeezed the daylights out of the flakes to get as much of the juice out as I could. After setting the Water/Coconut Milk to the side, I boiled the noodles (Penne Pasta) to an Al Dente state. While I was waiting on the noodles, I added the red pepper flakes, oil, and garlic into a frying pan. Once heated, I added the noodles, coconut water, and remaining ingredients. Ultimately it is not a really difficult recipe. The sauce wasn’t as thick as I had hoped for, but the flavor was excellent. Next time, I will make some changes to the recipe. First, I will use less water when preparing the coconut mix and possibly add some fresh coconut milk. Second, I will print the recipes rather than working directly off my cell phone. I accidentally missed a step toggling between two recipes. I don’t know if adding oil to the Al Dente noodles would have made a difference or not, but I hate to do things incorrectly on my first attempt with a new recipe. These minor changes might make a delicious difference in the future. Either way, my wife, sister-in-law, and friend all enjoyed the taste and experience. This was a worthy experiment, and I will make it again down the road. Maybe next time I could add some broccoli florets as well. So remember, “The recipe is not always right; take some time to make it your own.” I know I will.